Somehow my stash of tags didn't contain even one appropriate tag to tie onto my homemade banana bread that I planned to give to some friends. 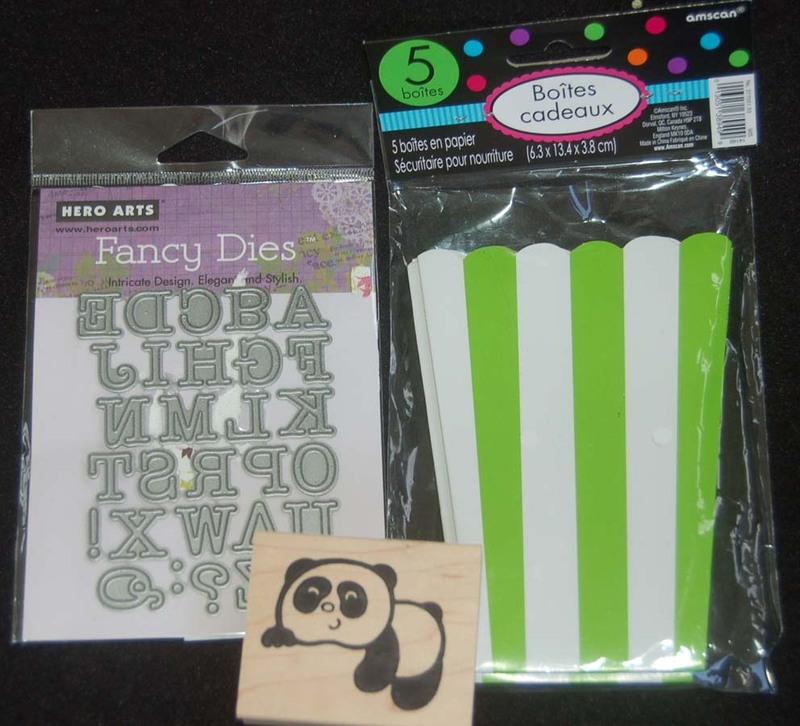 In a light-bulb moment, I remembered that I just purchased a Sizzix die and stamp set which I was sure would be perfect to whip up a suitable tag. Using a pre-made Snippets craft tag, I quickly added a scrap of DP and the stamped, colored, and die cut pieces. It was super easy to do and I liked the way the tag looked on a simple white bag (from HM Ben Franklin Crafts). I later decided that the tag fit better just tied to the cello bag (also from BFC) which contained the banana bread. The tag images were colored with Chameleon pens and I made extras so I wouldn't have to scramble around the next time I need a tag for my baked goodies. Hope that you will decorate your gift tags...it's fun to do and really do make the gift look more delicious. 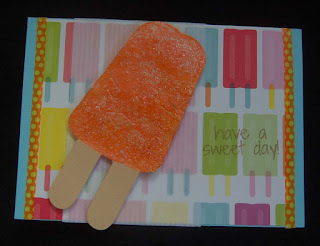 It's been so-o-o-o hot here that I just had to create a 'cool' card to make my craftroom seem less like an oven. 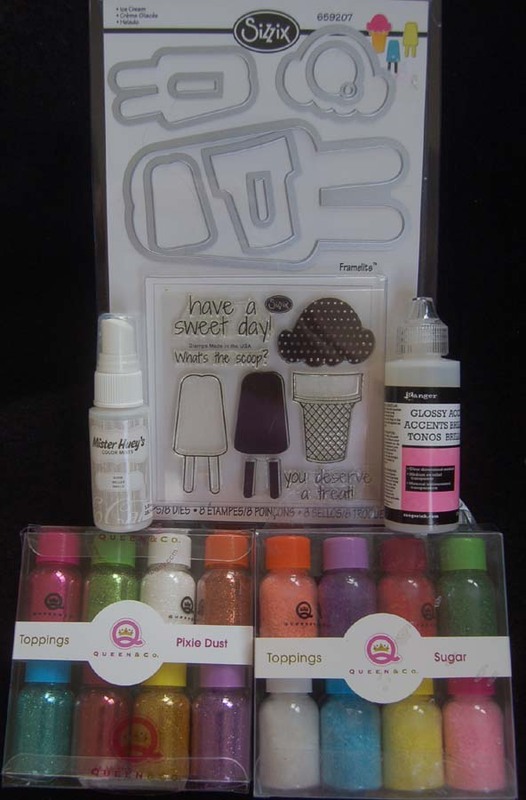 Here's what I came up with using a Sizzix die set, some Queen and Co. sprinkles, Mister Huey spray, washi tape and Ranger Glossy Accents. The American Crafts double-sided card stock with popsicle print really helped to pull the theme together. 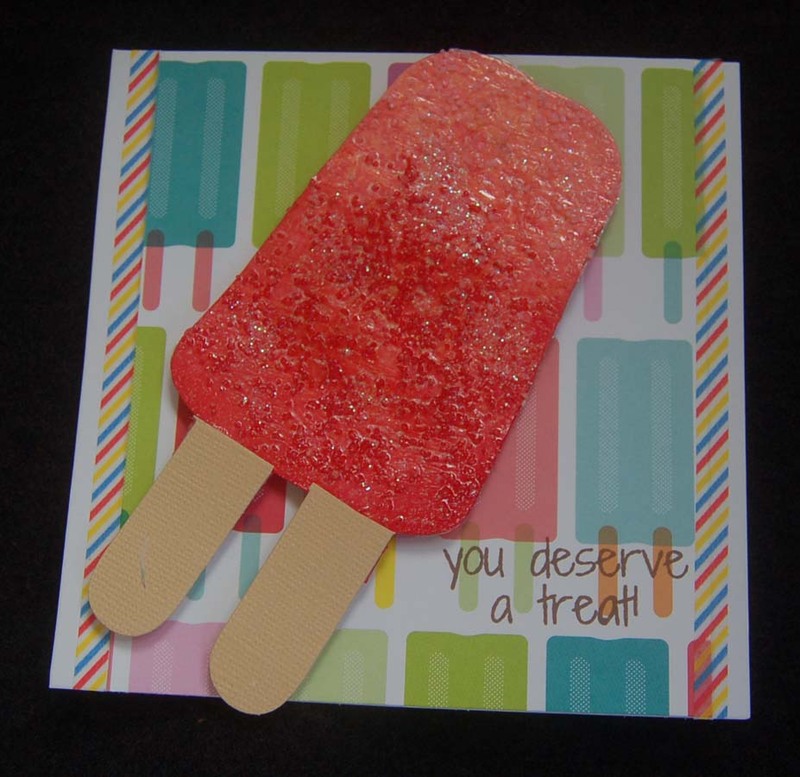 After die cutting the almost life-sized popsicle, I applied some Hero Arts ombre ink to the die-cut card stock before adding Glossy Accents and sprinkles. 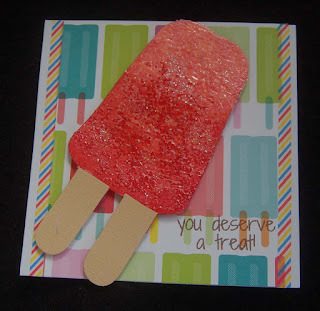 To add more shimmer I sprayed it with the iridescent Mister Huey and let it dry before gluing on the 'popsicle sticks' which were die cut with the same die. 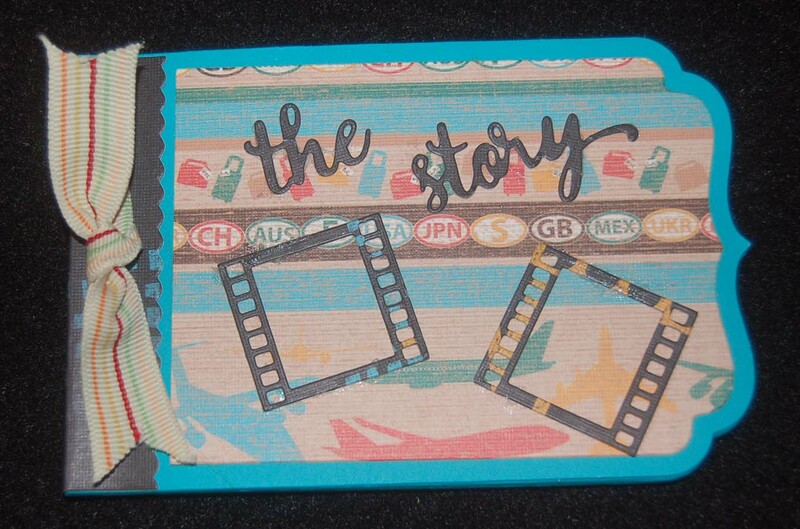 I liked both stamp sayings in the Sizzix set so I decided to use them on two similar cards. 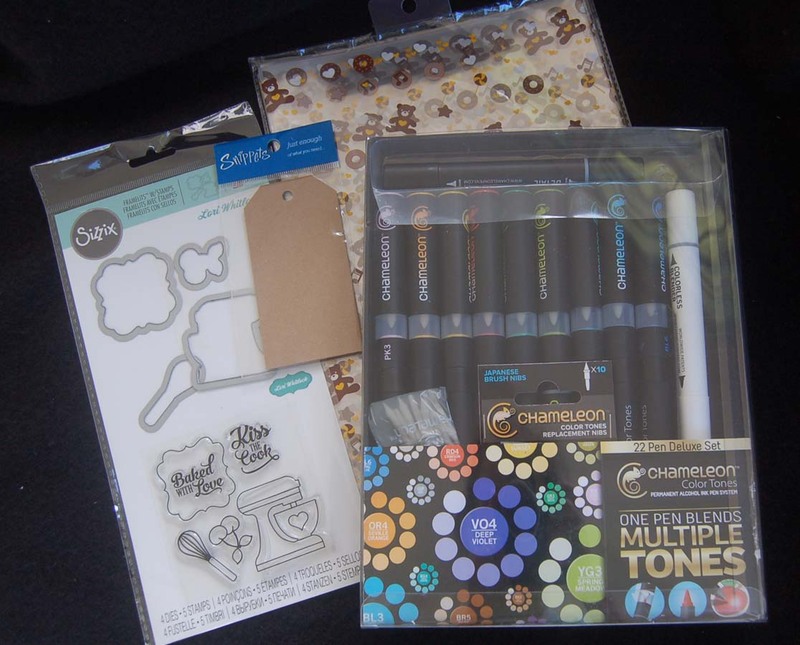 Most of the supplies should be for sale at HM Ben Franklin Crafts so be sure to head to the nearest store so you can make a 'cool' card, too. When mailing gifts it seems senseless to make fancy bows which will probably not survive the journey. 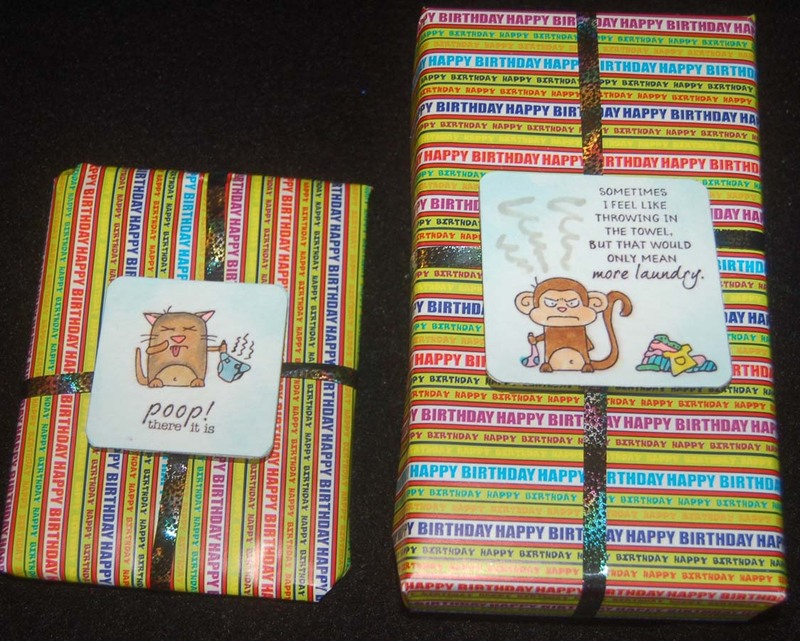 To resolve this problem, I decided to use some magnets for decoration on gifts that were going to be mailed. 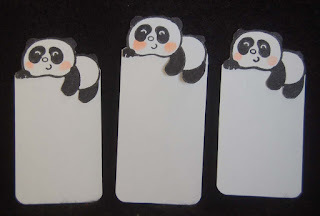 The magnets were made simply by stamping a cute image and sentiment onto a square of watercolor paper, coloring it, and then cutting a similar sized cardboard. I used spray adhesive (Elmer's from BFC) to adhere the pieces together and then sprayed the top with a non-gloss protective coating (also from HM Ben Franklin Crafts). A Crop-a-Dile (We are Memory Keepers) corner cutter (purchased at BFC) was used to round the corners. Finally, I glued on super strong magnets (from BFC) to the backs of the pieces. 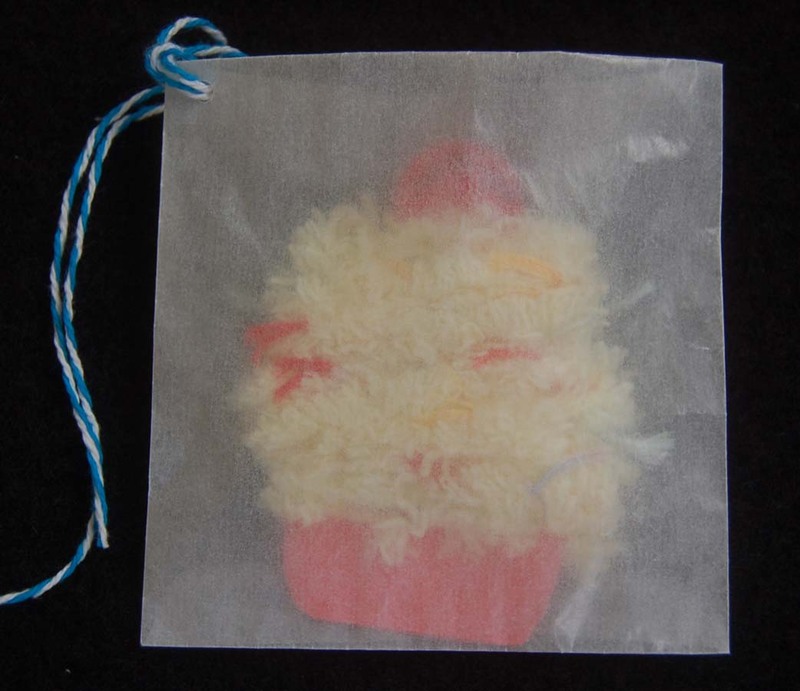 By attaching a metal paperclip to the ribbons on the packages, the magnets are easily attached and removed for use on a refrigerator. I love the snarky images and sayings on the Taylored Expression stamps and I feel these magnets add to the gift more than a smashed bow. Send some smiles across the miles! I couldn't believe how quickly this mini album came together. The Sizzix die set, Essential MIni Album, had all the parts to die cut the pages, spine, and page decorations. 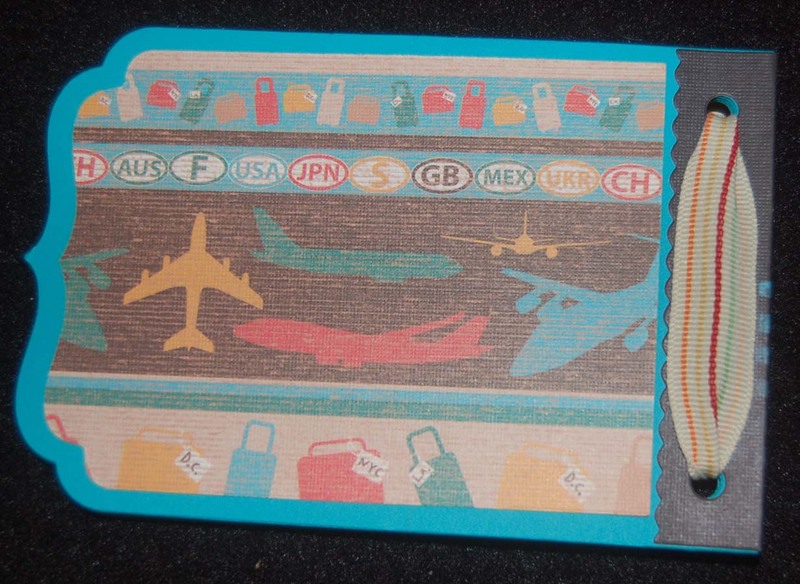 I put some printed card stock on the inner pages to add embellishments, photos and trip ephemera like ticket stubs. Of course I left some pages plain for journaling. The slide frames on the cover were only tacked down and will probably be filled in with some mini photos or perhaps the trip dates and destination. 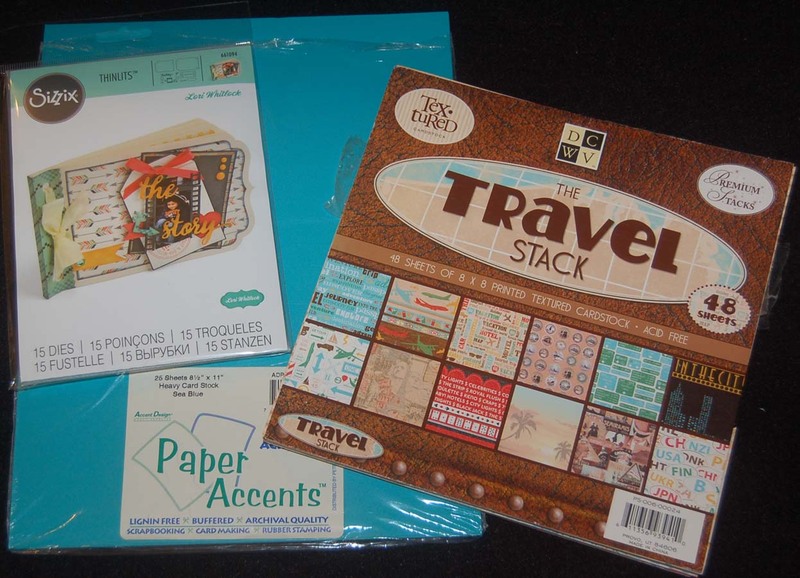 I am planning to take an erasable pen and a mini double stick tape dispenser on my trip so I can fill in my album as I travel. Often when I return from a trip I am pooped and forget the details of what we saw and did....old age...LOL! 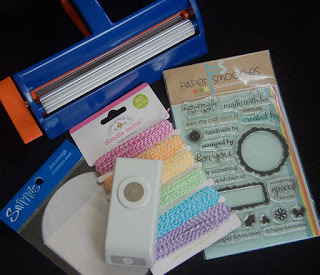 I hope that you will shop at HM Ben Franklin Crafts and invest in this Sizzix die set. 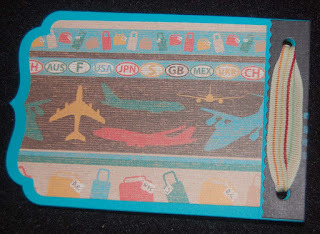 I know that you will find many uses for it besides a travel album. It might be useful for making a mini recipe collection or a gardening journal with pockets for seeds. Happy Creative Crafting! I enjoy making unique tags. They are quicker to create than cards and can serve the double duty of a gift decoration and gift card/message holder (or even a money holder...the frog one may bring good luck for someone going to Las Vegas). 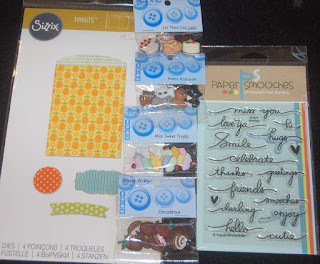 For these tags, I thought it would be fun to include some decorated paperclips. Whether or not you give money/gift card, the paperclips are just a cute add on. 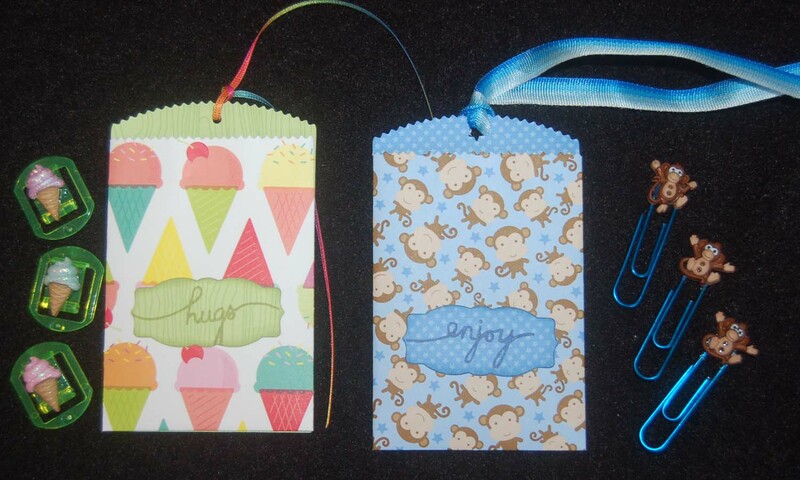 I used the Sizzix mini favor bag die to cut the pouch from double-sided card stock (that matched the Dress It Up buttons) (monkey paper- Doodlebug Design, frog paper - Bella BLVD, ice cream - American Crafts) I also cut a label (the die is from the same set) and stamped it with a Paper Smooches sentiment. After punching a hole on the top of the bag, I attached a ribbon (blue and rainbow ribbon are Heiko and the polka dot one is from American Crafts). There are lots of styles and sized of paperclips at office supply stores and I simply glued Dress It Up buttons (shanks snipped off) onto them. The buttons were from HM Ben Franklin Crafts as was the 527 glue (dries fast and clear). I can't resist cute buttons so these tags provided a reason for my shopaholic tendencies. 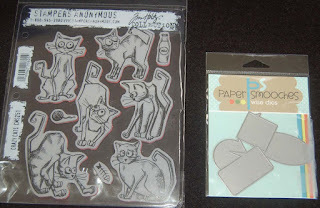 Now I just need to find more matching double-sided card stock.....LOL! 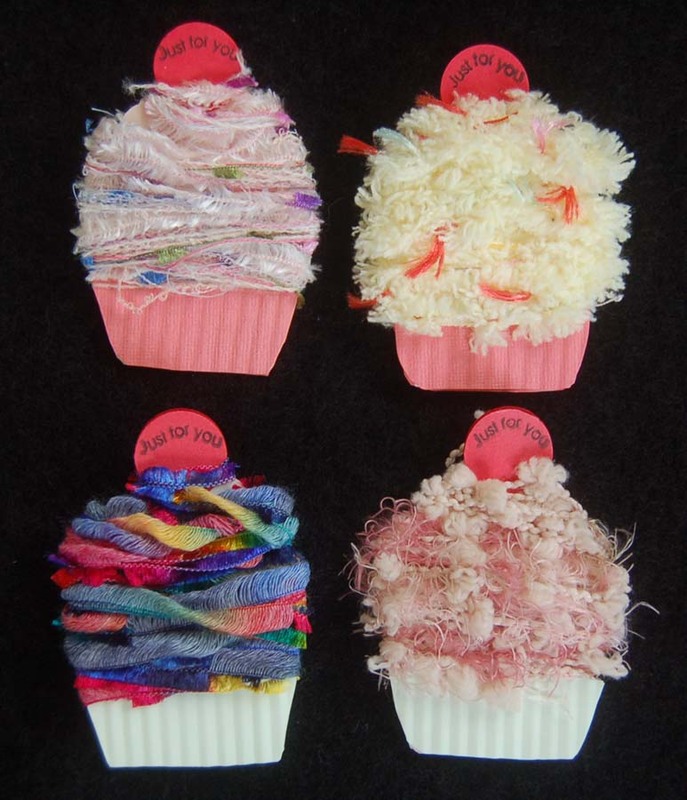 While in Japan I purchased a small cupcake card that had yarn wrapped all around like frosting on the cupcake. 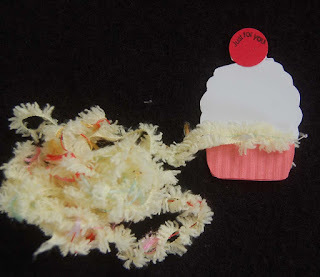 When the yarn was unwound, there was space to write your message on the cupcake. I thought that this clever item would make a unique tag and be a way to give a little something (a yard of specialty yarn) to the person receiving the tag. It is a really simple tag to make. 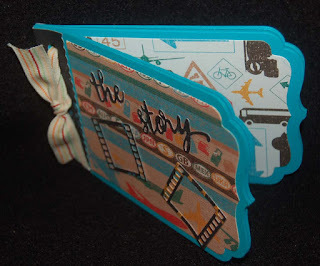 First you need to make the base tag from sturdy white card stock. 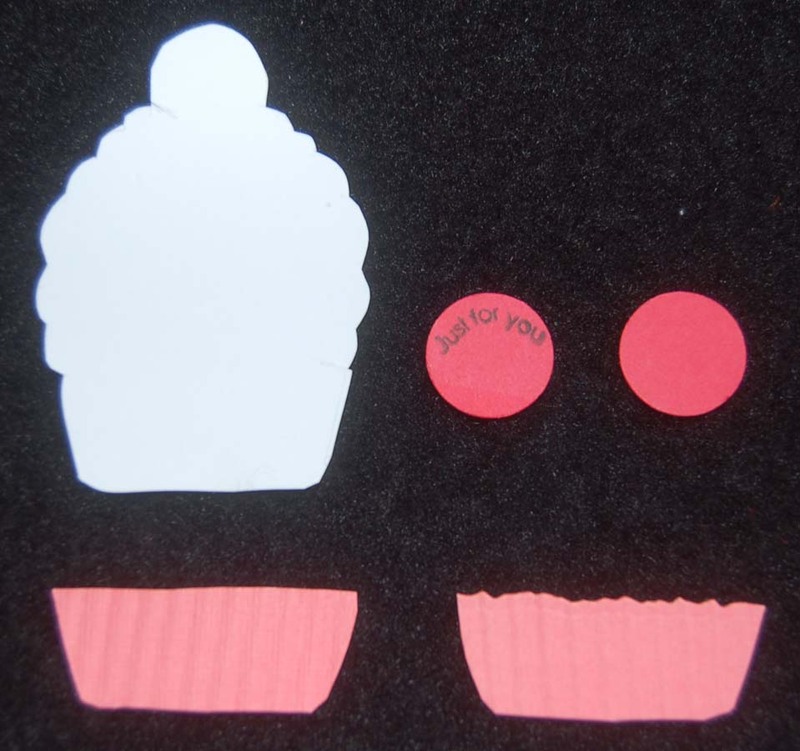 Then cut the two cupcake liners (front and back) from crimped ( used Fiskar paper crimper) card stock and punch out two red circles using a 3/4" punch (EK Success). 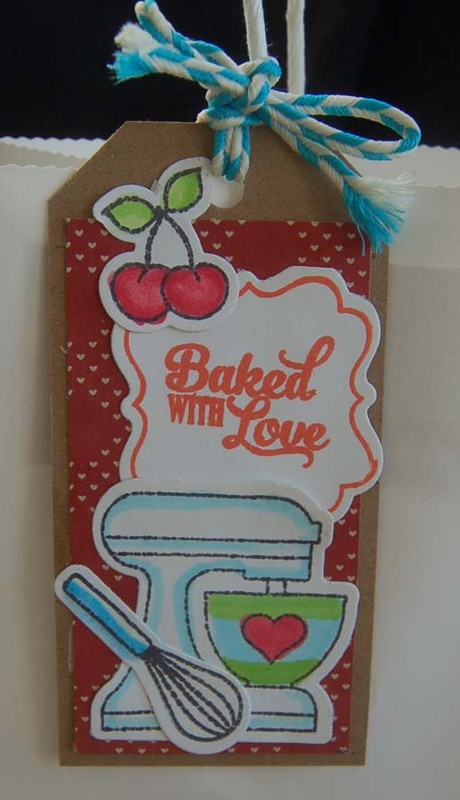 The Paper Smooches 'just for you' stamp was curved and used to stamp on one of the red 'cherries'. 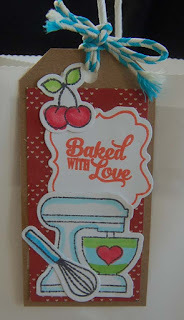 Next, glue the parts to the base tag and write your message on the tag. 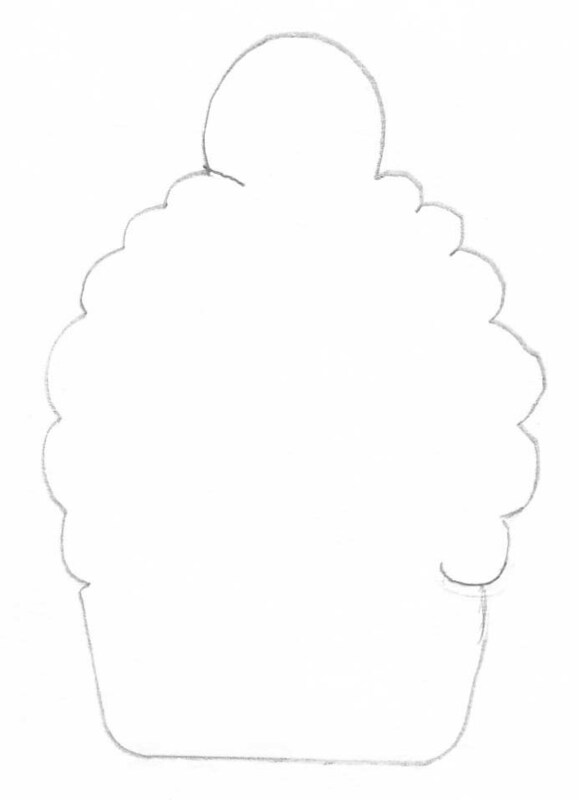 To 'frost' the cupcake, insert the yarn end into the bottom slit and wind the yarn around the tag and finish by inserting the other yarn tail into the top slit. 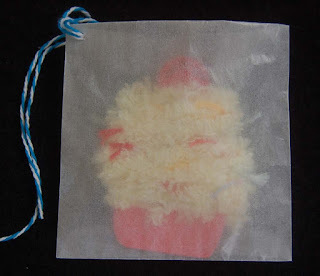 To make the cupcake look like it was in a glassine pastry package, I placed it into an envelope (Snippets 3-1/2" square) purchased from HM Ben Franklin Crafts. A piece of twine (Doodlebug Designs) was attached to the envelope holding the cupcake tag. 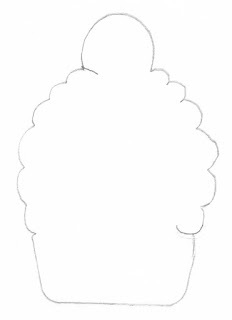 If you want to make one of these yarn cupcake tags you can use the template below to trace the tag base on your card stock. The finished tag should be approximately 3"x 2". Besides giving a unique tag, enjoying these 'cupcakes' have no calories and help to use up all those yarns leftover from lei making. 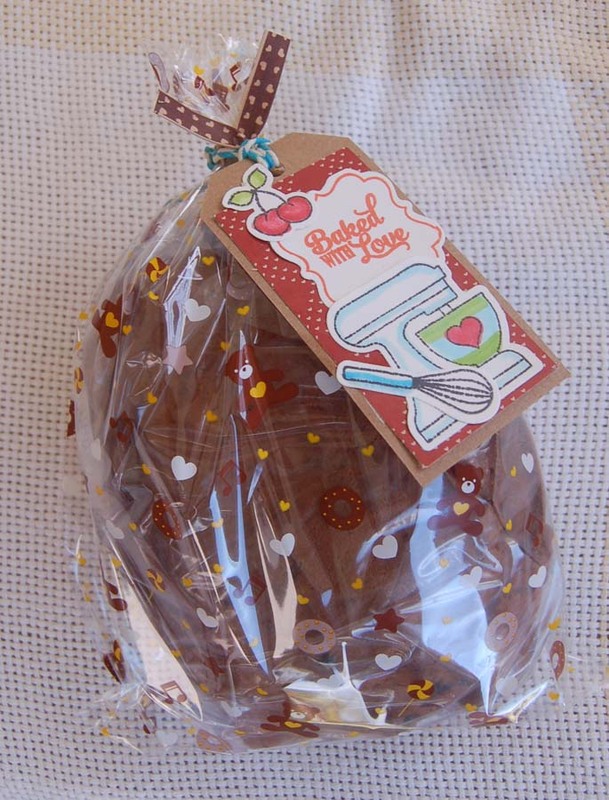 Happy crafty baking! 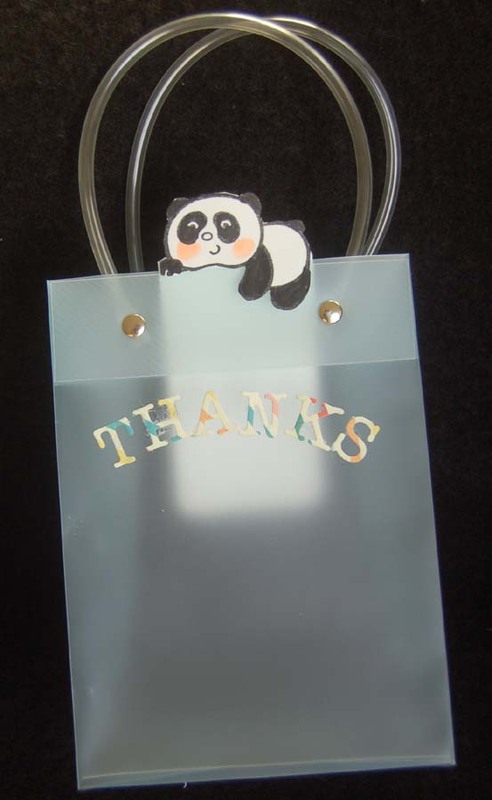 This panda message tag to hang on a bag or box was inspired by one I saw in Japan. 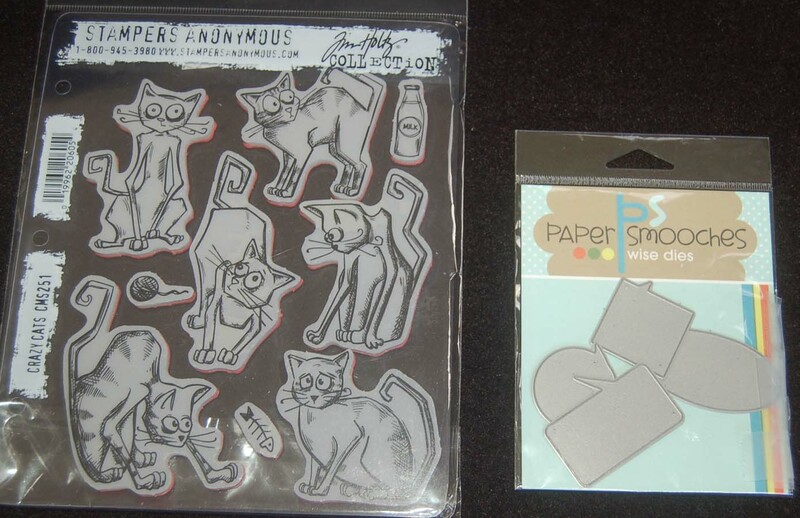 The Japanese one featured a cat and was a notepad of hanging message tags. I purchased the Taj wooden panda stamp from Taj Clubhouse in Ward Center. I first stamped the image on sturdy watercolor paper, colored the cheeks, and cut it out. 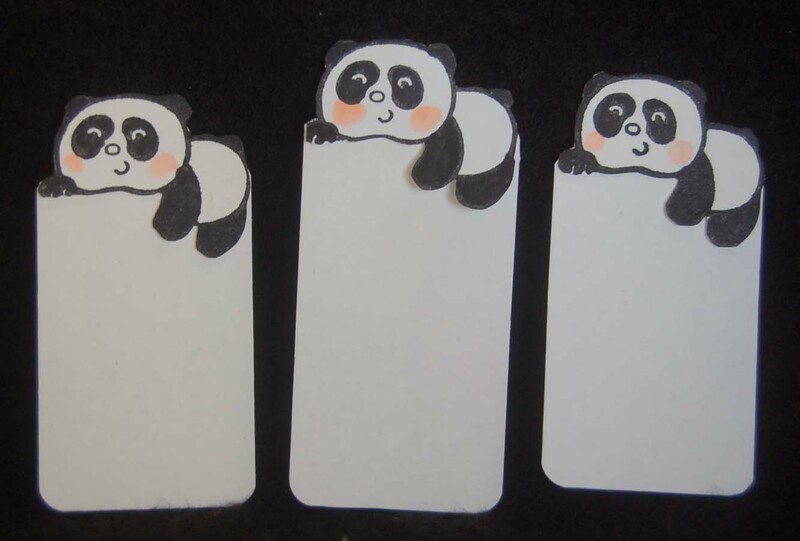 Next I made a rectangle from the same watercolor paper and glued the top-half of the panda onto the top of the rectangle. I cut around the top half of the panda and that was it! 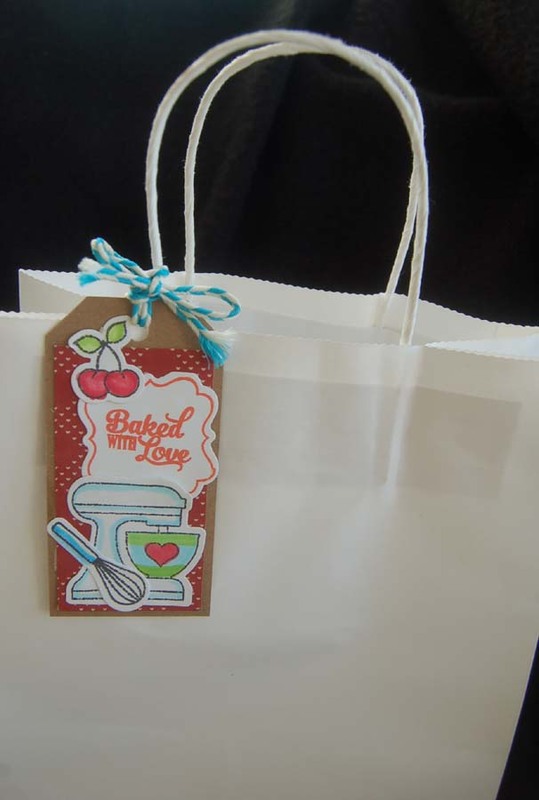 A message can be written on the tag before it is hung on a bag or box. Later the tag can be re-purposed as a bookmark. 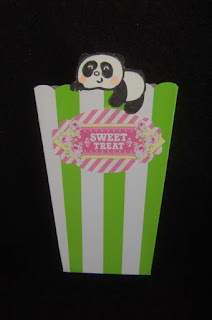 This popcorn box container was purchased at HM Ben Franklin Crafts (party department) and came in a set of five. The 'thanks' letters were cut from a printed scrap using the Hero Arts Fancy Letter Dies. I'm not sure where the sweet treat label came from...it was just in a messy pile on my desk....heeheehee! 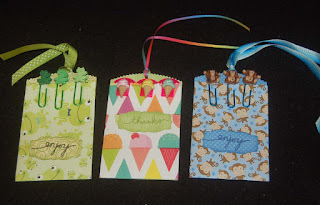 If you make a bunch of these tags you will be ready to give an impromptu gift to anyone. 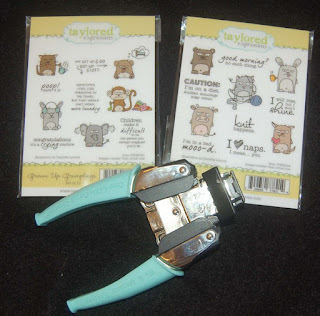 I'm sure that you can find many stamps with suitable images for this project. 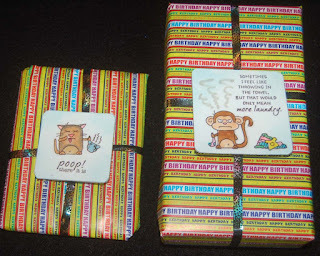 Happy gift giving! My son has two grey cat sisters who are remarkably different. One is bold and mischievous; the other is shy and well-behaved. 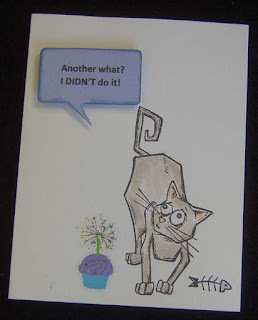 I thought it would be fun to use the Tim Holtz stamp set to make my son a wonky birthday card. 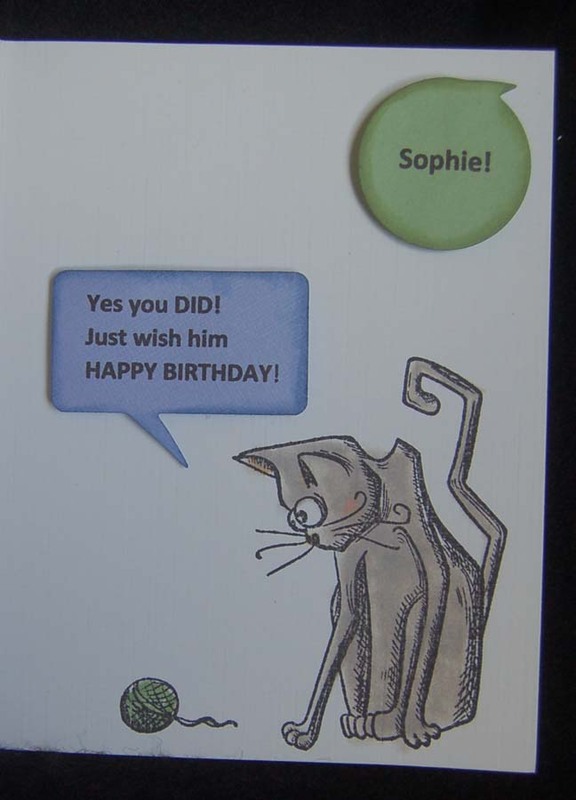 I used the Misti to align the cats and a computer to print on the PS die cut thought bubbles. 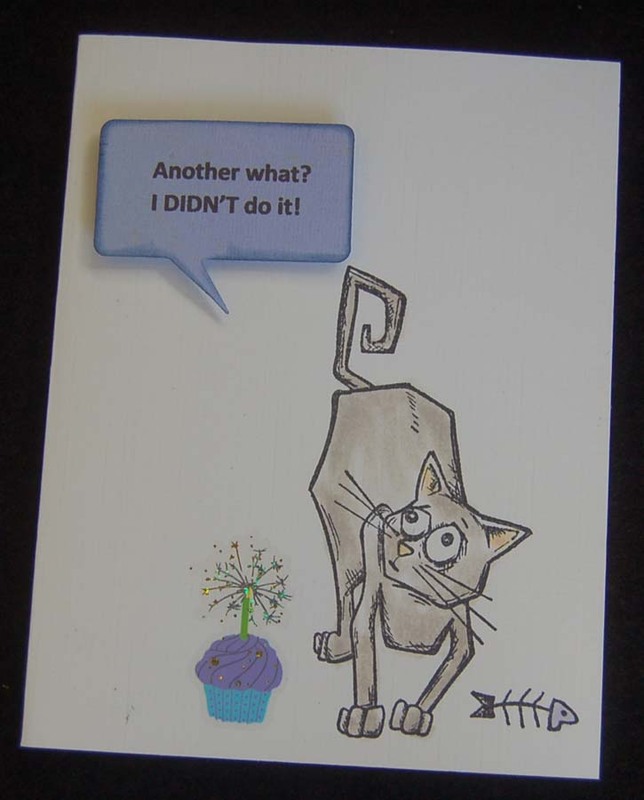 I liked the way this card turned out and it was super easy...a purrrfect card!